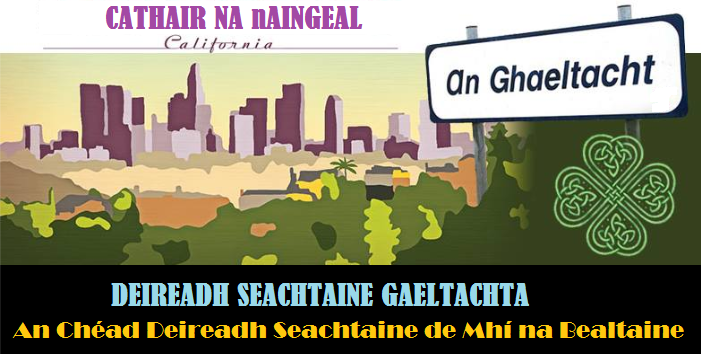 Deireadh Seachtaine Gaeltachta Los Angeles | An suíomh is fearr dá bhfacais ar WordPress.com! An suíomh is fearr dá bhfacais ar WordPress.com! 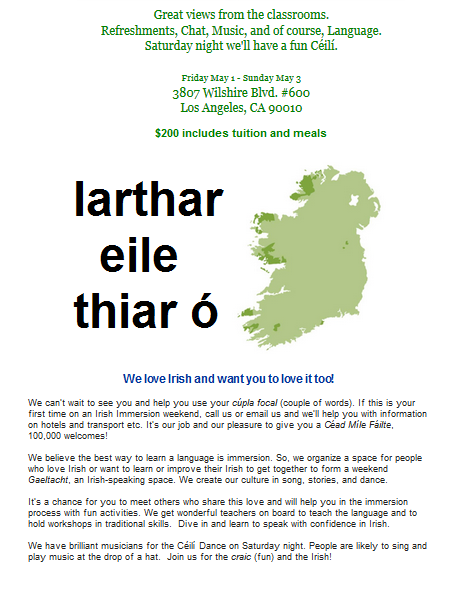 Deireadh Seachtaine Gaeltachta Bealtaine in LA! Beidh muid ag Otis College. Ealaín an téama againn i mbliana. Díreach in aice le LAX. Sceitimíní orainn faoi! Nuacht is déanaí: Tá Liam ar bord! Tá Bairbre ar bord! Beidh suíomh againn ann don scrúdu TEG! Accommodation and food not included in this price. Food can be purchased in the college. Here’s what happened last year. We DID it! RINNEAMR É! DSGSoCal 2018 done! Please take a minute to fill in the survey. We’d love your feedback There’s no room here for comments but you can email us at cnaglosangeles@gmail.com with thoughts, suggestions srl. Go raibh maith agaibh. Want to follow up with more info on how to improve your Irish? Check out this simple list of resources. Let’s review what happened at our Immersion Weekend this year. Seo a tharla ag an DSG againn i mbliana. Tháinig sibh! You came! In cars, in planes, on motorbikes. Tháinig sibh. Bhí craic againn le chéile! We had fun together! Hopefully, you learned something and are energized to learn more. We loved having you and confess to feeling very lonely when you left. What an amazing group of wonderful human beings! Dáiríre! 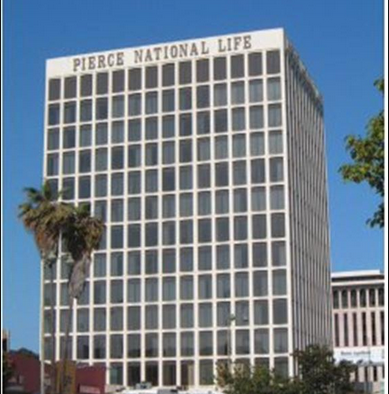 YOU energized US. Ardmheas daoibh ar fad ♥. Na cuimhní a bheas againn! The memories we’ll have! Every year we learn something. From that, we work to make it better every year. Highlights for me (I’m only allowed 3) were the iománaíocht (hurling), the Pop-Up Gaeltacht, and our múinteoirí who flew in to teach. Huge kudos to those who gave workshops. Special thanks to those who had stuff to carry: How did you get all those crafts organized, Jean? Thanks for bringing the cláirseach, Dennis! Mo cheol sibh ar fad! Buíochas le Erin agus Arge as daoine a fháil ó LAX agus a thabhairt ar ais ann. Le Maria, Joyce, agus Joe as cabhrú leis an mbia. Le Desiree agus Joyce as rudaí speisialta a dhéanamh don ócáid. Le Brendan’s agus Caitríona & Rónán ann a chabhraigh linn. Le Gypsy Ethnic Arts agus Céilí Rua a chabhraigh leis an gCéilí. Le daoine a bhí ag cabhrú agus ag glanadh: múinteoirí agus daltaí. Le AF International ar leo an scoil. Le rialtas na hÉireann a chabhraigh linn an uair seo. Le daoine a scaip an scéal (maith sibh Colleen ag Ventura County Star, Jim ag Irish Arts & Entertainment, John McNally, Tim McConville srl.). I will leave people out as so many helped this come together. Forgive me. Know that you are all, especially all who came to learn, laochra na Gaeilge (heroes of Irish). Because we’re growing, we’ll have 4 teachers and 4 levels in 2019☺. Seo a rinneamar. Here’s what we did! On Irish time 😉 Shur around those times 😉 Dheara. Clár ama 2018 – Déanta! See what we did in previous years below. Is laochra sibh ar fad! Míle buíochas ó chroí le Imelda, Taidhg, Donncha & a mhac, Jean, David, AF, Galt, Audrey, Conall, Paula a rinne arán dúinn, Diane a chuidigh leis an eagraíocht…. liosta le críochnú. Grá ollmhór dár laochra na Gaeilge ar fad. Níos mó pics ag teacht roimh i bhfad. bhí ár nGaeltacht féin againn don Deireadh Seachtaine. Bhí chuile dhuine, fiú na daoine nár fhoghlaim Gaeilge cheana, AR FHEABHAS! Scoraíocht: aisteoirí den scoth againn! Scrúdú le fáinne a fháil: úhú Paula! agus Gaeilge foghlamtha, ar ndóigh, agus in úsáid go nádúrtha. Seisiún den scoth ina dhiaidh i Santa Monica le Gaeilge ar fud na háite. Ardmholadh do Ramona Reeves a bhunaigh DSGLA & a chuireann a croí ann chuile bhliain. Ardmholadh do Shéamus, ár múinteoir Fulbright a thaiseal ó Idaho le bheith linn. Míle buíochas le Fulbright a sheol Séamus chugainn. Ardmholadh dár múinteoir Imelda, a thaisteal ó San Francisco le bheith linn. Ardmholadh d’Audrey a thiomáin ó California Thuaidh & a chas amháin dúinn. Buíochas speisialta le Tadhg Ó Máirtín a chas amhráin is a sheinn ceol dúinn. Buíochas speisialta le Nuala Kennedy a bhí linn & a chuir an seisiún ar siúl i Santa Monica. Buíochas le AF International College a thug cead dúinn an scoil a úsáid. Buíochas libh ar fad a scaip an scéal faoin ócáid seo. le chuile dhuine a chabhraigh linn idir ullmhúcháin agus glanadh suas. Bhí an t-ádh liom bheith le daoine chomh cliste sin le grá mór acu don teanga. Bhí gach duine dáiríre iontach. Rinne daoine nár fhoghlaim Gaeilge cheana dráma as Gaeilge!!! Filíocht, dráma, ceol, rince: bhí sé go léir againn. Pics le Joe, mo cheol thú! Yep, bhí sé le feiceáil ón seomra ranga!